Upload your contacts, organise them into groups. Start engaging with your existing and potential customers! Send bulk SMS text messages to your customers and prospects online from your Mobileroo account. A simple to use, market leading bulk SMS service for any business. Automate sending and receiving SMS marketing messages & CRM SMS texts directly from your application or server with our feature rich API Gateway. Mobileroo specialises in smart phones app development with expertise in iPhone and Android applications. We provide the best online SMS gateway that is so easy to use! Mobileroo saved our business thousands!! 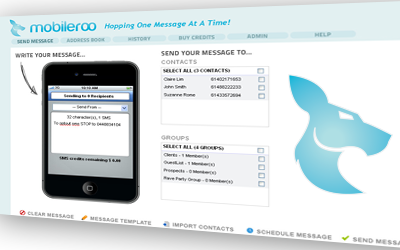 Mobileroo integrated SMS with our CRM system which has been a huge benefit to both our customers and our business. Mobileroo is very fast, professional, reliable and effective and I highly recommend their services.